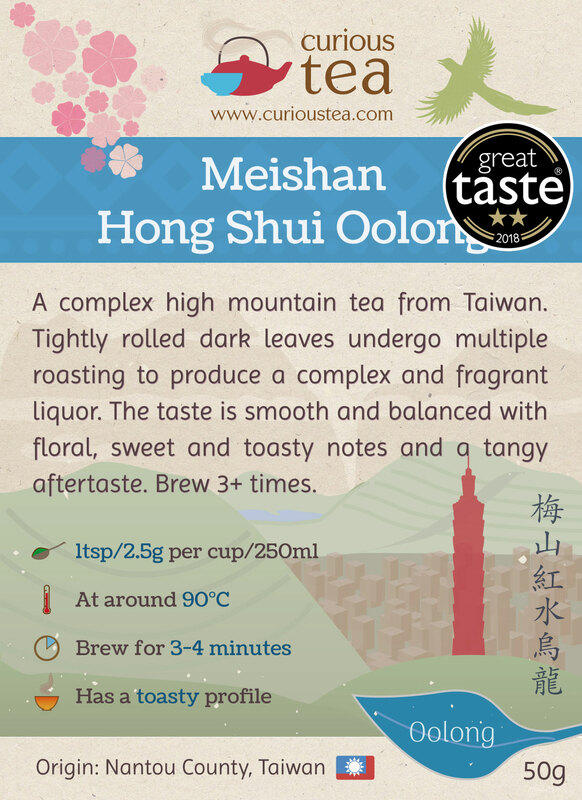 Meishan Hong Shui Red Water Oolong is a complex high mountain tea from Taiwan. Tightly rolled dark leaves undergo multiple roasting to produce a complex and fragrant liquor. 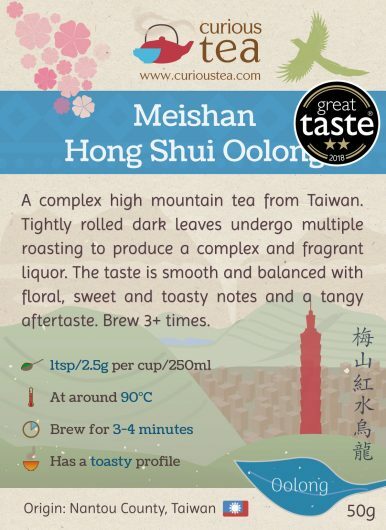 The taste is smooth and balanced with floral, sweet and toasty notes and a tangy aftertaste. 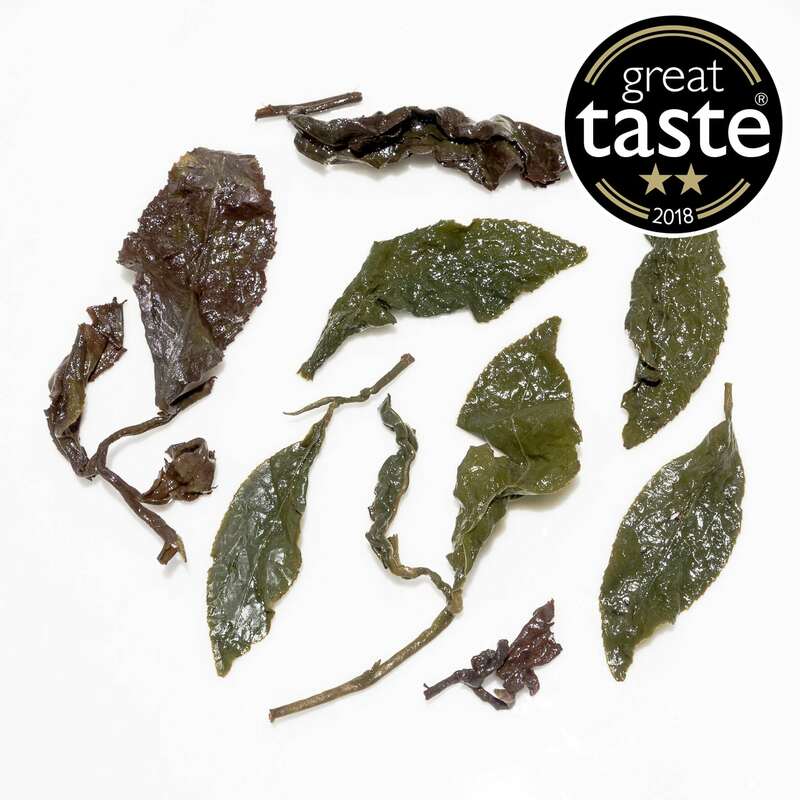 Meishan Hong Shui Red Water Oolong from Taiwan, winner of a 2-Star Great Taste Award in 2018. 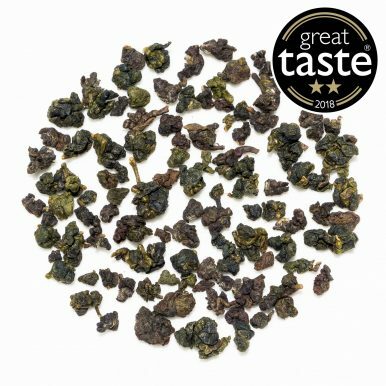 Meishan Hong Shui Red Water Oolong (梅山紅水烏龍) is a rather lovely high mountain floral oolong that has a captivating character and a complex floral profile. 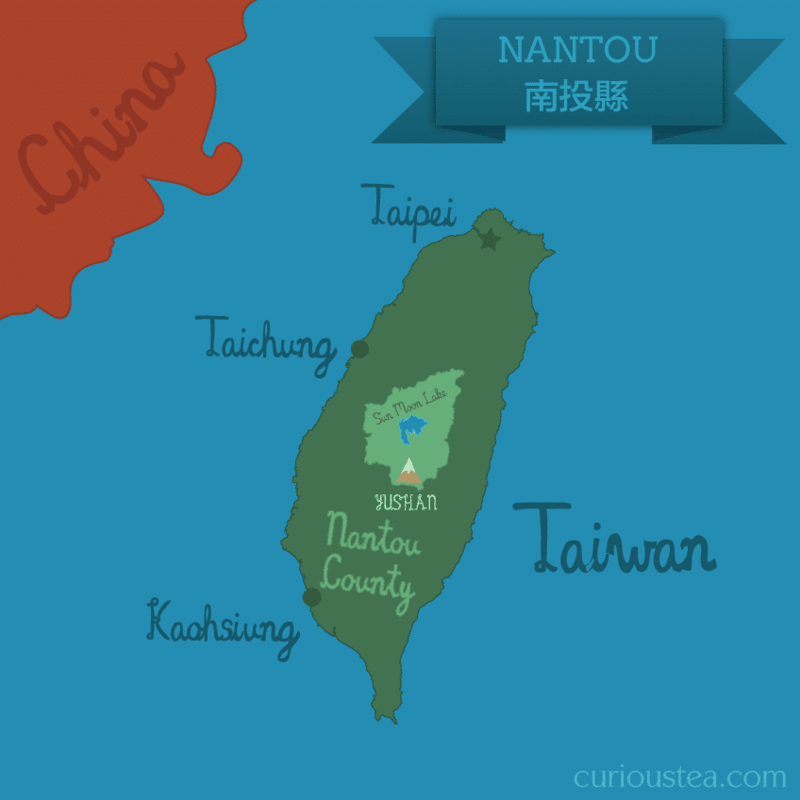 It hails from Lugu Township and is grown at an altitude of 1,000m. 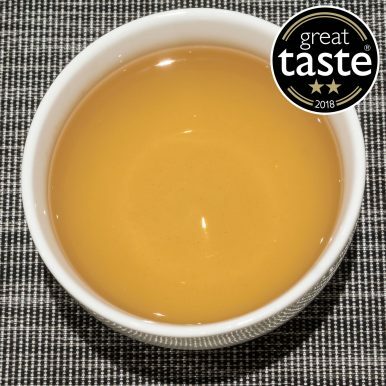 This Hong Shui (or Red Water) Oolong is from August 2018 harvest. 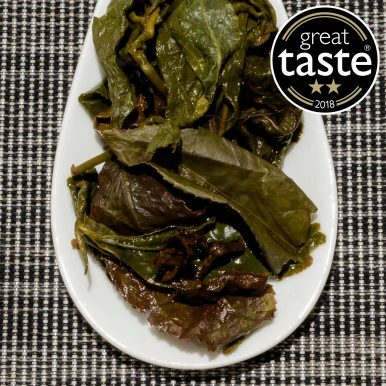 Very much like our traditional Dong Ding Oolong, this Meishan Hong Shui Oolong undergoes multiple baking or roasting stages. The resulting tea is completely in the middle of the oolong spectrum. 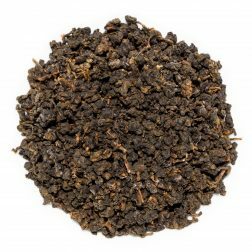 Some consider Hong Shui Oolong to be the original Dong Ding Oolong as they also used to be more heavily roasted. However, with changing tastes over time, lighter and more floral oolongs became fashionable. It seems that the original Dong Ding Oolong recipe changed to adapt to tea drinkers’ new preferences. Whether Hong Shui Oolong really is the old style Dong Ding, it is not entirely clear, but it is certainly closer to it than to the modern light floral oolongs that are dominant in Lugu and most other parts of Taiwan. After all, a lighter green style of oolong is a popular choice amongst producers, as it is a lot less skill intensive and time consuming to produce while being popular with tea drinkers. Meishan Hong Shui Red Water Oolong is made from a Green Heart or Qing Xin (青心) tea plant varietal that is the cultivar of choice for teas that have a pronounced floral fragrance and taste. This cultivar is also used in our Meishan Qing Xin Green Heart Oolong that is characteristically floral. As this oolong undergoes extensive baking, it also exhibits some of the darker oolong qualities, such as comforting roasted flavours, while retaining the dominant floral notes. To achieve this balance, the tea has to undergo multiple baking sessions with time of rest in between. The skill of the tea master is paramount in achieving a fine balance between the floral and the roasted aspects of this tea, as neither should overpower. 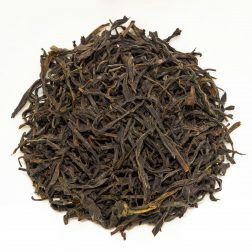 This Meishan Hong Shui Red Water Oolong comes in tightly rolled dark leaves. 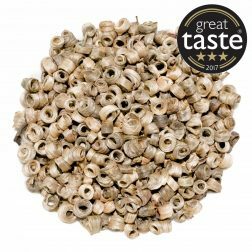 These open up when brewed to produce a fragrant amber liquor with a pronounced floral aroma that is slightly toasty and spicy. 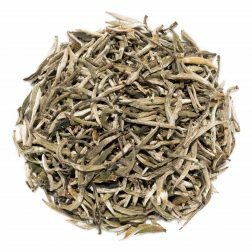 The baking of this tea results in a very comforting profile, with a character that is floral, yet toasty. The complex flavours develop and change with each steep. The taste has notes of caramel and sugared fruits, while the aftertaste is a little savoury and tangy. This beautifully crafted tea should be enjoyed over repeated steeps, taking time to appreciate the changing and developing complex taste. 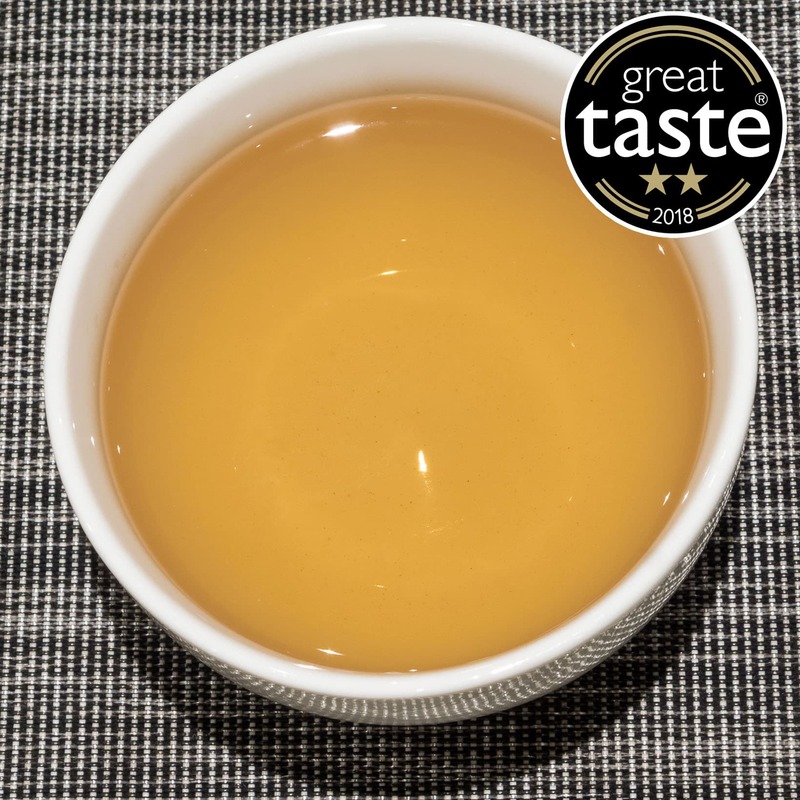 This Meishan Hong Shui Red Water Oolong tea was first featured in our December 2017 Curious Tea Subscription Boxes.